So this is the first project/event that I did that had me thinking I should really start blogging, that their might be other people out there that just live and breathe and dig this creative stuff. I guess it’s kind of cheating since I made all of these things over a month ago, but since I haven’t shared it here yet, we’ll consider it a new topic. 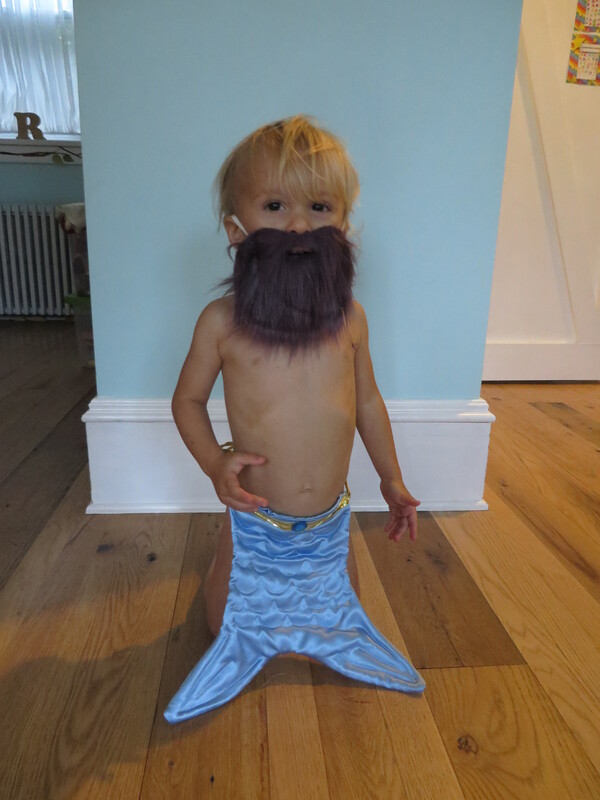 My daughter’s fourth birthday was looming and she was all about The Little Mermaid. So was my two-year-old son, for that matter. Please take absolutely no offense here if you are a fan of the full-on Disney birthday party. The decoration packages are absolutely adorable, I agree. (I also own all of the Disney Princess movies, thanks to a slightly crazy, princess-obsessed grandmother – my mom.) But, I swear, there’s something wrong w/ my insides. If I don’t do something really over-the-top, craft-wise, for my kids’ birthdays, I feel like I’ve let not only them down, but myself. But, to get back on track here, I decided to sew some mermaid costumes using some costume satin i had lying around from the last few birthday parties. Since the party was held at a bounce house party center, I wasn’t able to make a skirt/dress type costume, as I thought it would be too limiting w/ movement. In addition to the costumes for my kids (my son insisted on being King Triton), I also made a photo-op board for the kids at the party. 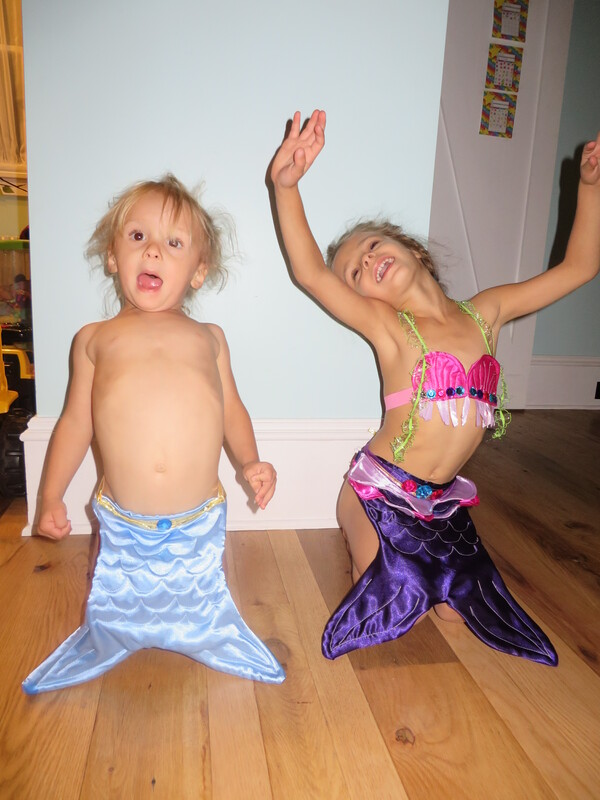 I lined them up and took their pictures in their mermaid bodies and emailed each parent a copy of the picture. I think they enjoyed it! So here are some pictures of the finished costumes and the finished photo-ops. I think these are some great ideas to personalize your party on the cheap while fulfilling your itch for crafting! Total cost (I’m estimating here as I had many of the items in my stash already) of both costumes, under $20. Total cost of photo-op boards, $2 (for the poster board from Dollar Tree). 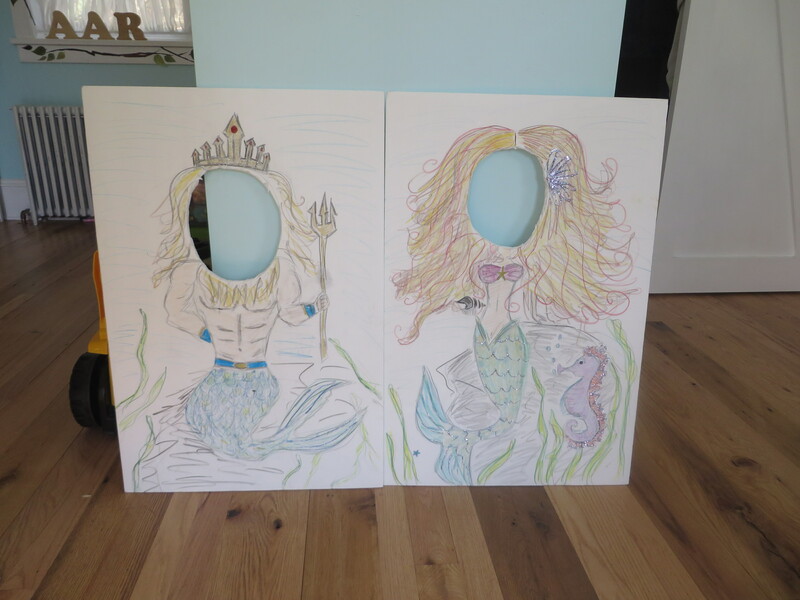 Mermaid Photo-op Boards for my daughter’s birthday. If anyone has any interest in a tutorial for the mermaid costumes, please let me know! I’ll let you direct me, because I am wordy and probably way too passionate on these things! What do you do for your children’s parties that you think I’d love to try? Next > Last Few Days With Our Praying Mantis, Duncan!